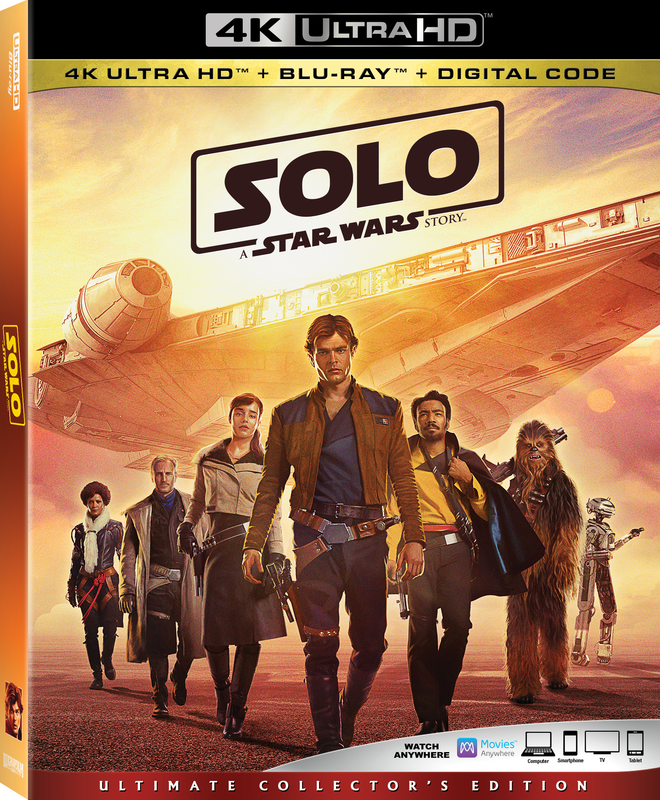 Solo Wars took it back to the Star Wars very beginning and now it is out for Blu-ray 4K Ultra HD™, Blu-ray™, DVD and On-Demand! I will be honest, I didn’t get a chance to see it in theaters but I have the Blu-Ray + DVD and I can’t wait to watch it! Lucasfilm’s “Solo: A Star Wars Story,” directed by Academy Award®–winning filmmaker Ron Howard—the creator of unforgettable films, such as “A Beautiful Mind,” “Apollo 13,” “Parenthood” and “Splash”—took moviegoers on this summer’s wildest ride with the most beloved scoundrel in the galaxy, Han Solo (Alden Ehrenreich). The action-packed journey explores Han’s first encounters with future friend and copilot Chewbacca (Joonas Suotamo) and notorious gambler Lando Calrissian (Donald Glover), as well as his adventure-filled past alongside fellow street thief Qi’ra (Emilia Clarke) and career criminal Beckett (Woody Harrelson). Watch instantly on Sept. 14thas the Millennium Falcon sets course digitally in HD and 4K Ultra HD™ and on Movies Anywhere, and bring the adventure home on Blu-ray 4K Ultra HD™, Blu-ray™, DVD and On-Demand on Sept. 25. 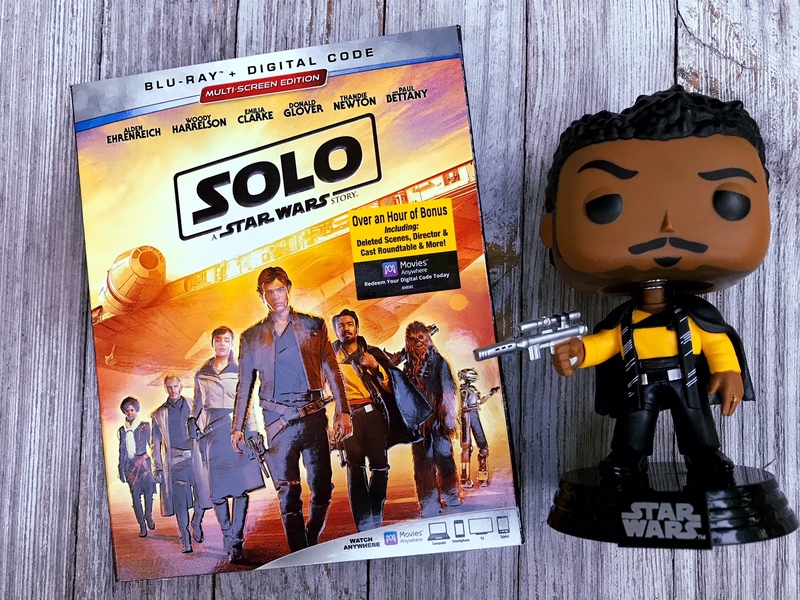 I am a huge Funko Pop collector and fan, so I had to show my love and support to Donald Glover/Lando Calrissian character pop! Sit down with director Ron Howard and the stars for an intimate and entertaining discussion of the film’s making. See what it takes to bring your favorite Wookiee to life in this lighthearted look behind the scenes. Iconic Star Wars screenwriter Lawrence Kasdan and son Jonathan share what it was like to write the movie’s script together. Get behind the wheel for the making of this high-octane chase through the streets of Corellia. Explore the challenges and thrills of creating this action-packed sequence, including its remote location and spectacular effects. Meet the newest droid—and the talented actor who helps bring her to life. Take an in-depth tour of the rough-and-tumble bar where strangers mix and gamblers risk all in the legendary card game, Sabaac. Join Han and Chewie at the controls of the Millennium Falcon to see how this legendary moment in Star Wars history unfolds. The Millennium Falcon: From Page to Park – An exclusive look at the history of the most famous ship in the galaxy, its origin and development, and how it will translate in one of the most anticipated expansions in Disneyland’s history. Have you seen Solo Wars? I am a not so typical, unstereotypical 20something year old lady who is trying to make my mark on this planet. This blog has many aspect through my visual perspective through photos, words & wittiness. I am highly creative, I love to socialize, and also a social media butterfly. I don’t follow trends, I create them. My video gamer brother would love this. Will pass it on to him. Great news. It was always best experience to watch movies on 4k hd. Will definitely going to watch this. I love star wars. I’m definitely going for this. Not a chance that I will miss it out. OMG Funkos are so cute! I know that a lot of people didn’t like Solo but I thought it was a really fun back story movie. That Funko figure rocks! I think I’m going to enjoy this movie. We’re definitely ready to watch it on our big screen. I’m so excited to own this movie! We are huge Star Wars fans and watch the movies all the time… one more to the collection is very welcome! We truly love this movie! My son is has every Star Wars movie and is excited his collection just keeps growing. We’re so excited to bring this one home! 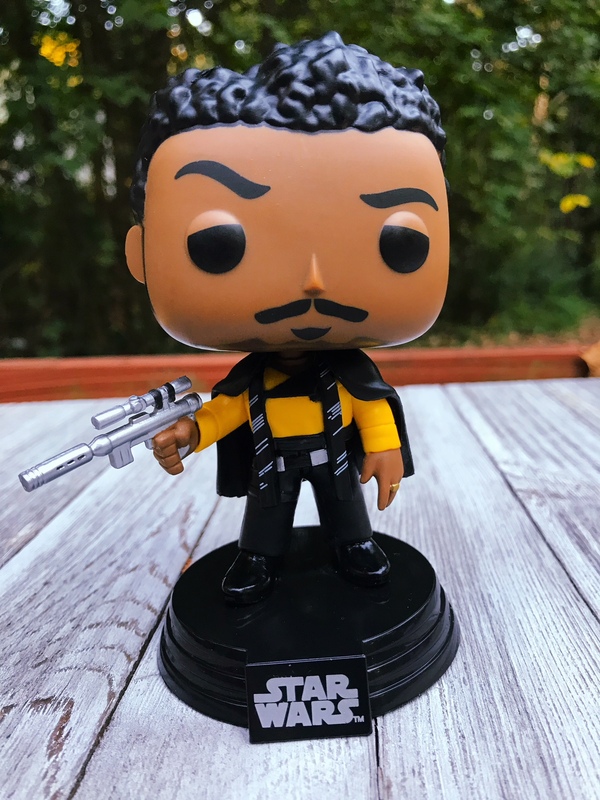 I love the Lando Pop! I just knew when I saw this was a movie review that you would have a Funko Pop of one of the characters. Love it! thanks for the great review. I haven’t seen this movie yet but I will be buying it when it comes out on the 25th. I can’t wait! I love Star Wars. I am really behind in my Star Wars movies. I think getting the extra footage would be a huge perk though. This is totally something my kids would be into. They absolutely loves the movie. We got it and loved it. So much fun and a great addition to the Star Wars story. Funko Pop Vinyls are cool, I have some of the various collections. We never got to go see Solo Wars in the cinema, but now it’s out on DVD, I’ll have to check it out. My son wants this movie! I need to pick it up! it looks like another amazing film from the Star Wars saga! I will be organising a backyard movie night and this would be amazing to watch with the kids! I never really got in to Star Wars. I feel like it’s so far gone it may be too late lol. I’m gonna share this post with my brothers though!! OK so now I need to ask my son if he heard of this one. I have never heard of this part of the Star Wars series. Love the little figurine. I think I will get the DVD and the Funko for the Manchild. He loves all things Star Wars. He has a nice Funko collection of the others. Yes, I’ve seen the movie and I loved it. “Solo” was eye-opening for me and help me understand the overall story much better. My entire family loved it. 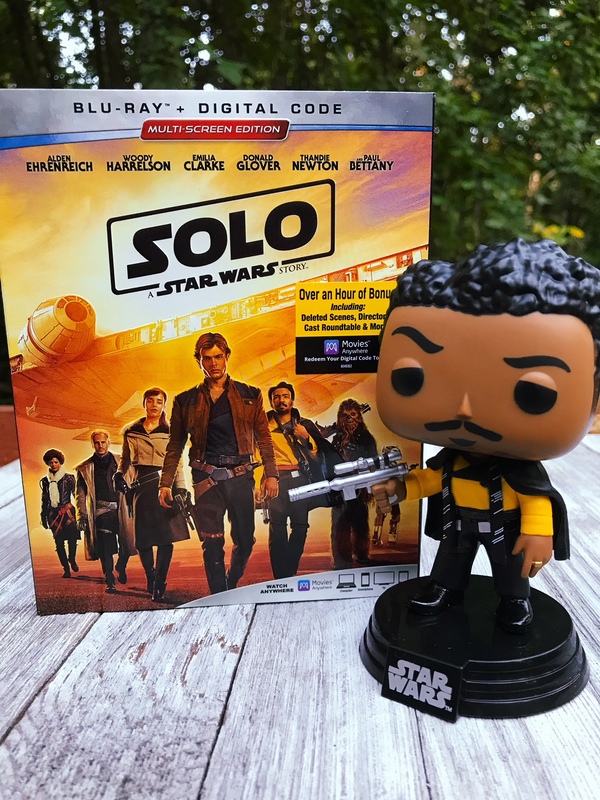 I enjoyed every second of this movie and Glover made the perfect Lando! he needs his own standalone Starwars movie. I’ll be honest. I’m not the biggest Star Wars Fan, but those little falcons are too cute! Might make it worth my seeing this movie!I love the Funko. We can’t wait to add this to the arsenal. The doll is a bonus. Thanks for sharing. You know, my husband has never seen any Star Wars movie. Maybe I will get the DVD so we can have an date night in. I’ve never seen any Star Wars film. Would you suggest I start with this one or start from film release date?